This item is a return for the Double Dirtbike Carrier+Ramp Only Part#AM1306A. 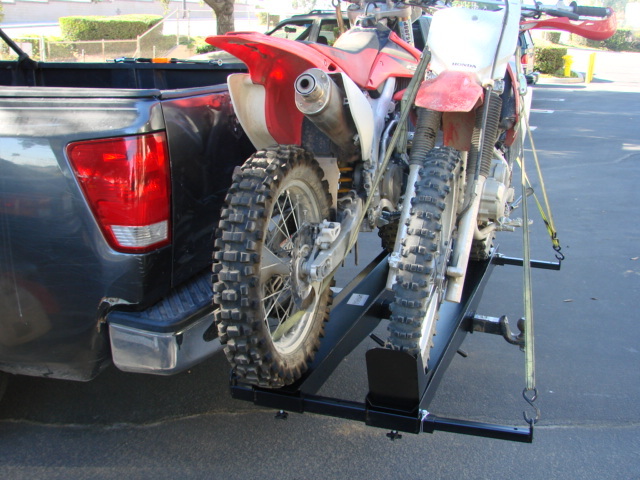 This hitch mounted motorcycle carrier is the solution to transport TWO dirt bikes. The motorcycle carrier has a 1000 lb weight capacity. Safely carry 2 dirtbikes without the hassles and storage of a cumbersome trailer!. This double carrier is a motorcycle carrier which mounts using your vehicle’s 2″ receiver. Specially designed for transporting motocross bikes, enduro bikes or off-road dirt bikes. 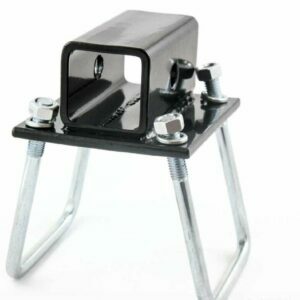 Simply roll your motorcycle up the carrier’s ramps and use straps to secure the bike to the carrier rails. 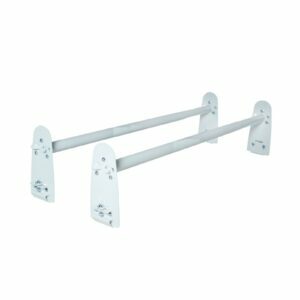 Each rail is 72″ long with a raised adjustable wheel stop that serves as a stabilizing wheel chock. 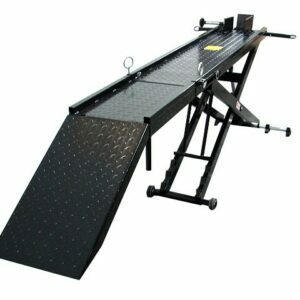 The 58″ long loading ramp stores under the carrier which has hooked end to secure the ramp when loading. Your motorcycles ride safely behind your vehicle. This item is a return or exchange of AM1306A. May have scratches, small dings, and/or other wear-and-tear, but works like new. Hardware may be incomplete or missing. Packaging may be missing and may ship in return box or equivalent. Box will have signs of travel wear and marks. Either the customer made a mistake and ordered the wrong product, or we the seller may have shipped the wrong product. This item does not come with warranty and is sold As-Is. No returns, No refunds, and No exchanges.